When Starbucks’ Global Responsibility Head, Zarah Perez, asks me to be a Dialogues speaker, I hold off on giving an answer. Having attended a few Dialogues at Starbucks, I’m intimidated by the “loftiness” of the discussions: Environment, Volunteerism, Filipino heritage and pride, Social Entrepreneurship. Compared to those, food writing seems so flighty a topic. A program adapted from Starbucks in the UK, the Dialogues are 60-minute moderated discussions that aim to encourage an exchange “… between advocates of a cause and an audience that [is] highly interested in getting to know more about [it]… all in a relaxed and informal environment i.e. 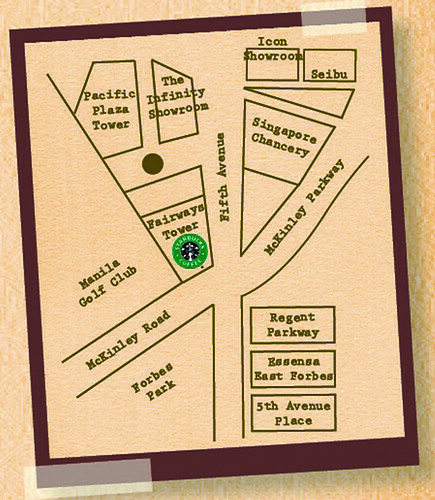 any one of [the] Starbucks cafés. In her email, Zarah tells me that this month’s theme for the Dialogues is Education, loosely translated as ”˜beyond the classroom: unique learning experiences.’ “… I think beyond your success with blogging, your unique perspective behind Dessert Comes First is a great template for approaching life and learning,” she writes. I’m flattered by her words but still unsure. I’ve been asked before to give talks about food blogging, more specifically, on how to write about food, but I always decline because frankly, I don’t know how to talk about what I do ”“ I don’t think about it or talk about it ”“ I just do it. I don’t intend for that to come out as big-headed or boastful but food and everything about it has always been natural for me and it’s something that I work at everyday. – and the debut of my new “baby.” (No hints about what this could possibly be, please! [wink]). FREE PARKING at the side of the store. Ask guard for assistance. This is a FREE event. No reservations/payments required. See you there! If I’m free, then I’m there. 🙂 I’d never heard of those Dialogues before. I would’ve been interested in a couple of those previous topics. Do you know how one gets info on it? That sounds like an interesting format, and I wish Starbucks had promoted the other topics as well! I bet it’s going to be one interesting Dialogue 🙂 Good luck! I’ve never been to this particular Starbucks branch before. The combination of your talk, Starbucks coffee and dessert sound fabulous! oh no, I just missed this event. I hope there will be another. Hi Lori, I really enjoyed being a part of this. Thanks for sharing your take on writing about food. It will be like sharing your foodie experience, sans the calories! I hope this happens again, and next time with a bigger audience. Cheers!